These players are wearing the Symbol of Avarice, a rare drop you can get from killing a Mimic - makes sense, seeing as how it is literally the head of a dead one. 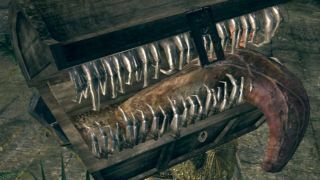 Then, much like the real monster, they lay the promise of treasure in front of players and see who takes the bait. Those that do are attacked. Those that use an Undead Hunter Charm (which turns real Mimics passive) are allowed to carry on. The Dark Souls PvP community is a strange, yet mostly honorable one. Kudos to these folks for making it even more interesting.